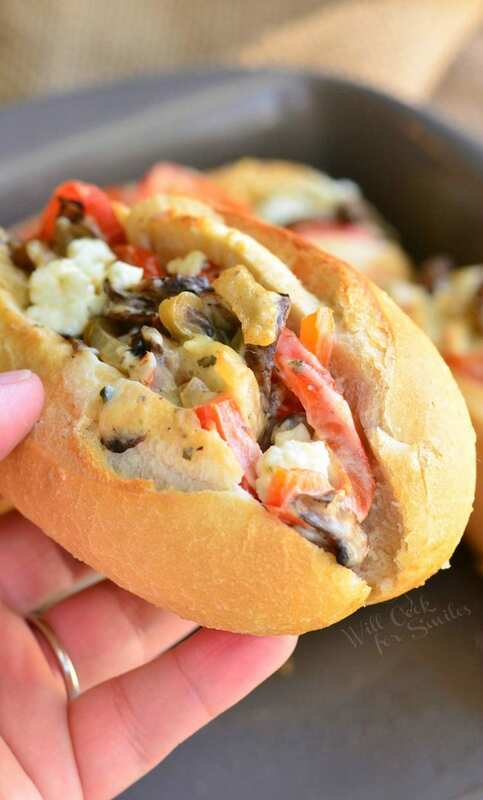 Delicious, cheesy, creamy little hot sandwiches that are perfect for a spring lunch or brunch. 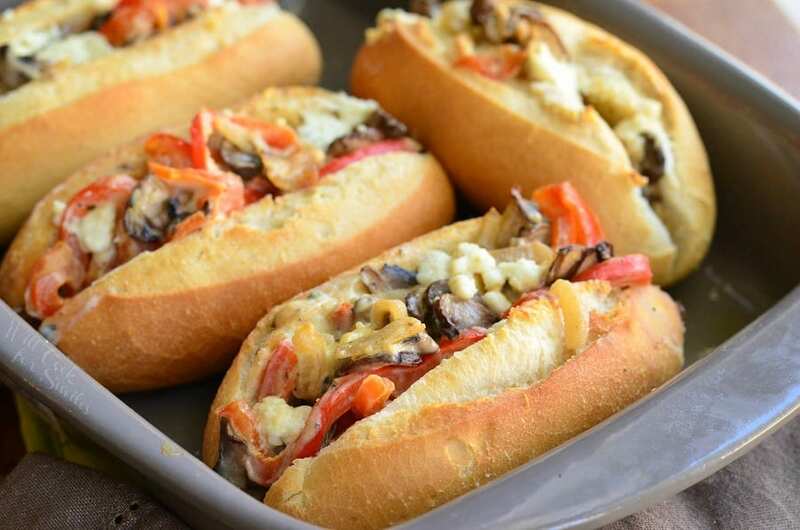 These sandwiches are made with veggies, creamy garlic and herb cheese and baked in little French baguette breads. 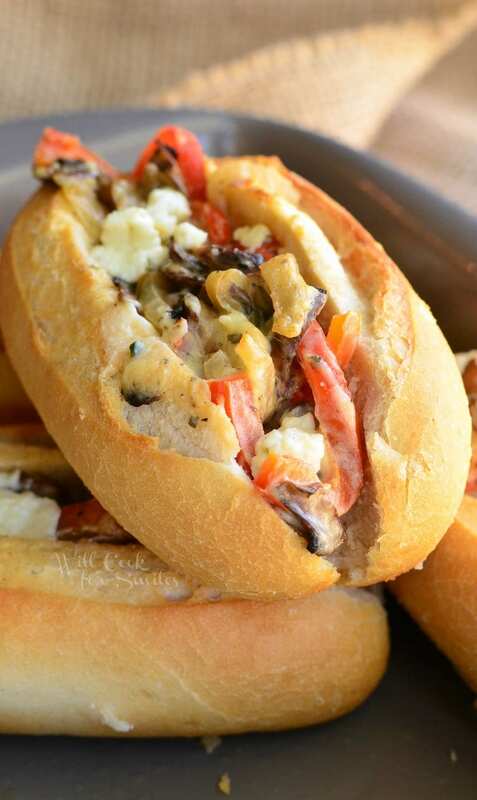 Did you know that hot sandwiches make a great party food? Well, they do. I actually discovered just how good they are at our housewarming party last week. I served hot mini sandwiches, among other snacks, and they flew off in a flash. So I played around with another idea for mini sandwiches and created these mini hot sandwiches on little baguette breads. 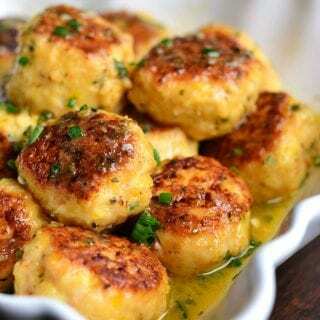 These would be perfect for a lunch or a brunch gathering during the upcoming holidays. For example, if you will be throwing an Easter Egg Hunt party, definitely make these for your guests. Personally, I always prefer hot sandwiches over cold. At the restaurants, I don’t even look at the cold sandwich options and when I make any sandwich at home, I make it hot. Now don’t be silly, of course I don’t make peanut butter and jelly hot, although there is such thing is fried peanut butter and jelly. So aside from a couple of options that have to be cold, I throw most sandwiches on the pan or in the oven. The biggest reason is definitely cheese. In the perfect sandwich world, it should be gooey and melty. 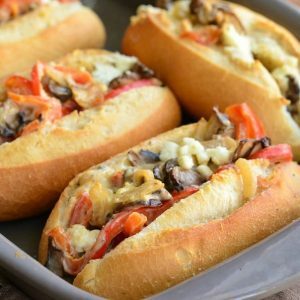 I tried a new cheese while making these tasty hot veggie sandwiches too. 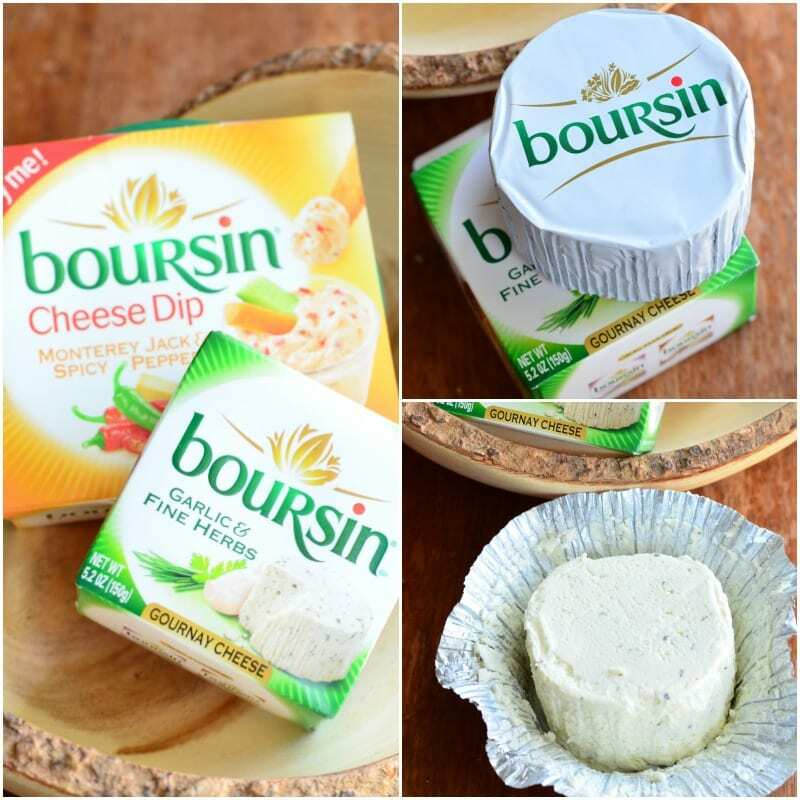 I tried Boursin® Garlic and Herb cheese and it was heavenly. It’s a creamy, soft cheese that crumbles and melts like a dream. 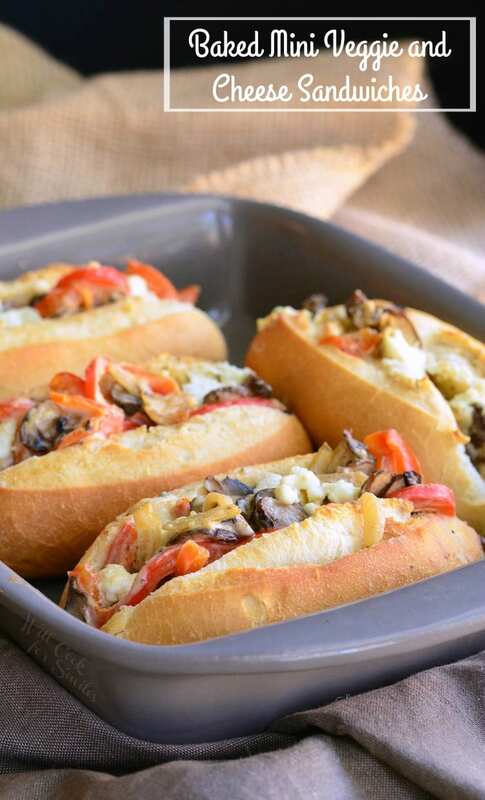 It’s absolutely perfect for stuffed mushrooms, hot cheese dips, and hot sandwiches of course. I found this cheese at my local Walmart store, that also happens to be the store where I discovered these mini French Baguette breads in the deli section. They also have mini chiabatta buns that I can’t wait to try next. While I was picking up the Garlic & Herb cheese, I also noticed another product right next to it, the Boursin® Monterey Jack and Spicy Pepper Cheese Dip. It sounded really good. Pretty much anything that has the words “Monterrey Jack” or “Asiago” in it, has my attention. I tried this dip as well and I actually used it as a spread. It was fantastic to add to a cold club sandwich (which my husband loves) or to a grilled cheese. That’s, of course, an option besides dipping your veggies in it. 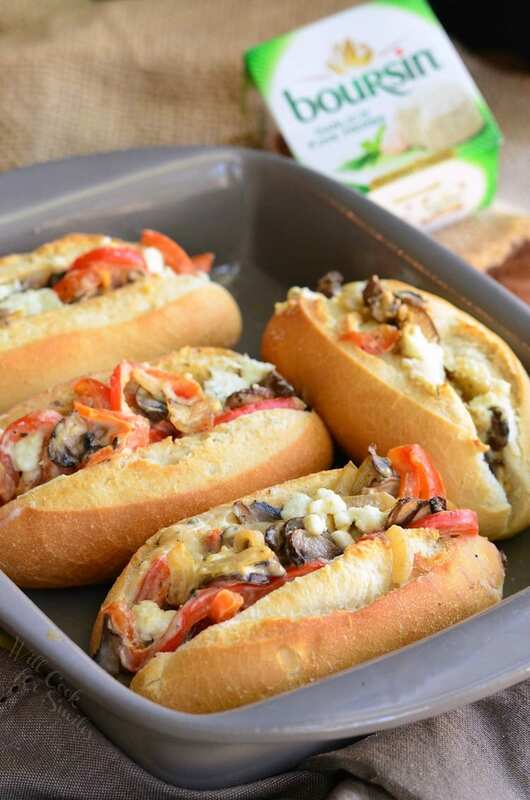 These sandwiches are made with veggies, creamy garlic and herb cheese and baked in little French baguette breads. 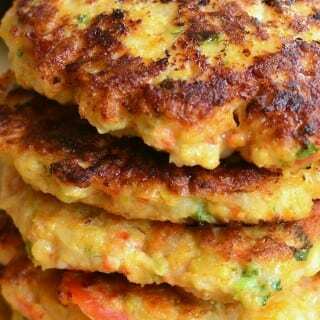 Preheat a large cooking pan oven medium heat and add vegetable oil. Saute sliced onion and peppers until starts to soften and add sliced mushrooms. 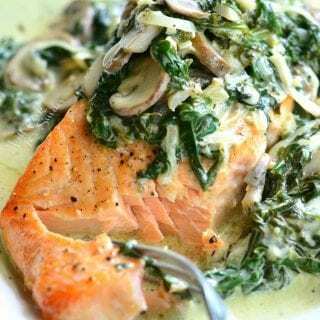 Add salt and pepper to taste and cook, stirring occasionally, until fully cooked. Take off heat. 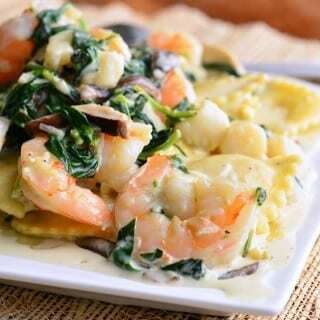 Break up the garlic and herb cheese into the pan with veggies and stir until completely incorporated. 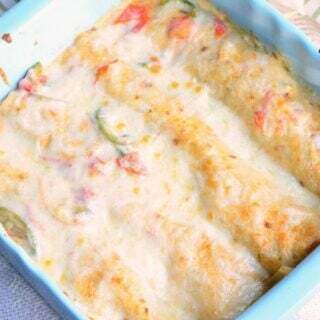 Divide cheesy veggie filling among the rolls. Place mini sandwiches into the baking dish (dishes) and bake them for about 15 minutes. For a chance to WIN a $50.00 gift card to WalMart, all you have to do is share your creation using Boursin cheese with me on Instagram (make sure to tag me in your post). 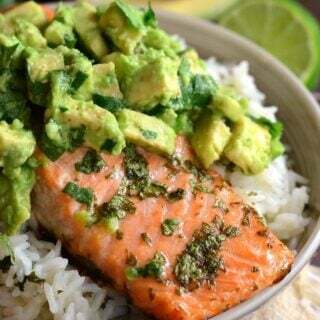 So run out to your local WalMart, pick up some Boursin cheese and make whatever you want. Make sure to tag me and use at my Instagram account and use #BoursinParty hashtag so I can see what you made and you will have a chance to get the gift card! Make sure to check boursinpartytricks.com to find the WalMart near you that carries this tasty cheese! This contest is open for all my readers 18 years old and up and will run from 3/16/16 to 4/3/16. Winner will be chosen on April 3rd, 2016!